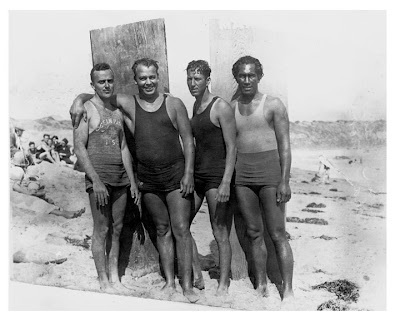 Gerald Vultee, Owen Hale, Bill Herwig, and Duke Kahanamoku, circa 1925 (most likely at Corona del Mar). This is one of hundreds of images that our photo editor, Steve Wilkings is currently scanning. They're on loan to us from Pete's daughter, Lisa.